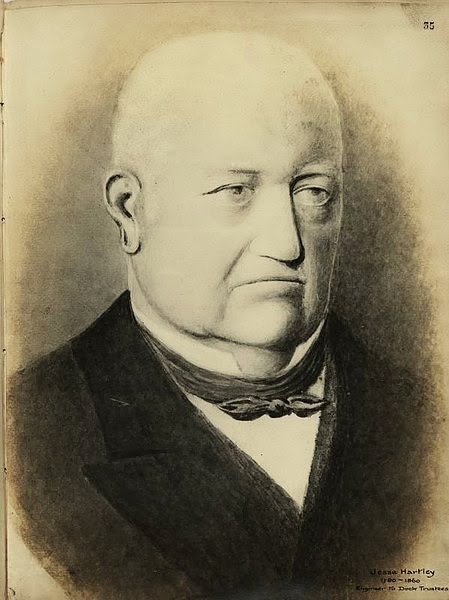 Liverpool's links with Canada go back to at least 1772, when Charles Dixon sailed from Liverpool in the 'Duke of York', to found a family dynasty in Nova Scotia. The plentiful timber available along the Canadian coast was a prime attraction - hence the port of Liverpool's Canada Dock. 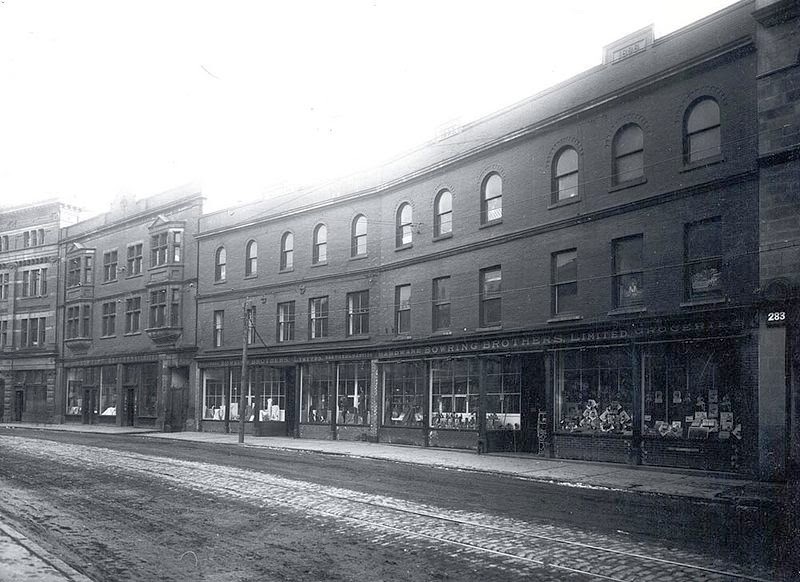 Records show that by 1808 Liverpool merchants were acquiring land in Prince Edward Island for timber and fisheries. In 1852, 34 million cubic feet of Canadian planks came into Liverpool, along with 10 million cubic feet of pine, in some 373 ships. Canada Dock, is part of the Port of Liverpool. It is situated in the northern dock system in Kirkdale. Canada Dock consists of a main basin nearest the river wall with three branch docks and a graving dock to the east. It is connected to Brocklebank Dock to the north and Huskisson Dock to the south. The dock was designed by Jesse Hartley opening in 1859. Canada Dock dealt in timber being named after the main source of the trade, Canada. Fire was the greatest concern and the dock was initially kept isolated from the rest of the dock system for safety reasons. The original river entrance also presented navigational difficulties, with the area affected by silting. Modifications to the basin took place in the late nineteenth and early twentieth centuries, creating the branch docks and graving dock. Further improvements took place during the 1950s and 1960s as the dock became a base for cargo liner companies such as Harrison Line. Several significant commercial names stand out in Liverpool/Canadian commercial history. The name of Bowring is written large in Liverpool's political history. The family firm of C.T. Bowring came here in the 1820s bringing cod liver oil and seal products. The seal fishing firm of Bulley and Job of Newfoundland had also set itself up here in 1809 as leading providers of fishery stores. These firms were also leaders in the import of British goods to Canada. 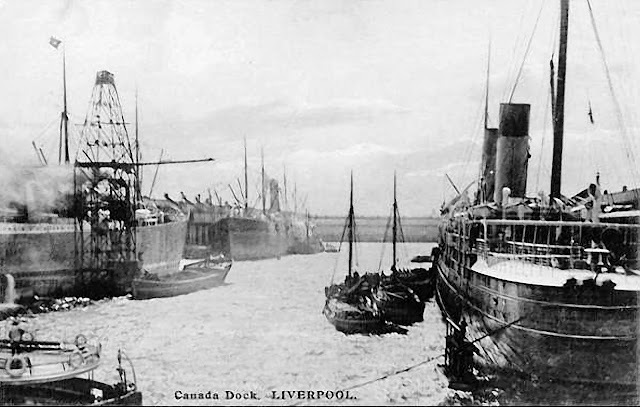 From 1900, a major import into Liverpool was Canadian wheat (and still is). Liverpool imported 5.7 million quarters of wheat out of a total of 24.7 for the UK. A good proportion of this was Canadian. 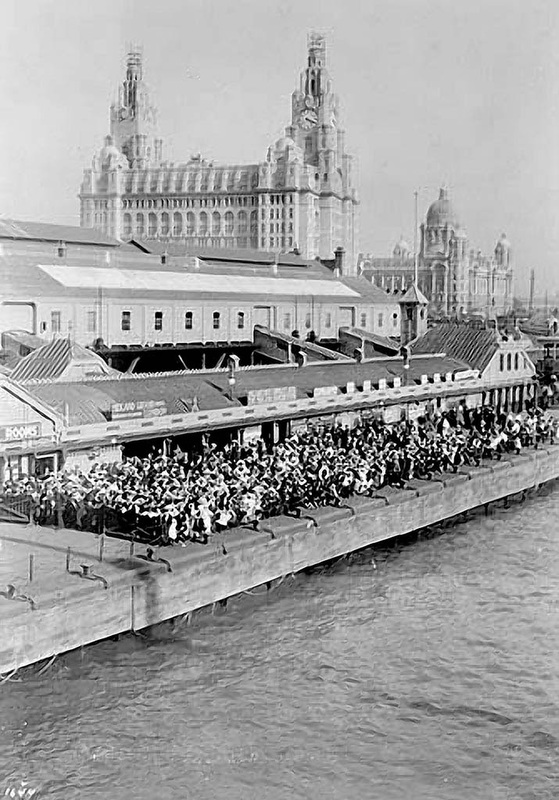 Emigration to Canada via Liverpool continued throughout the 19th century and was second only to the US in popularity. Indeed, from 1818-1826, 1830-1832, and in 1834 it was more popular than the US. From then on it was usually a close second. In 1847, emigration peaked owing to the Irish famine. 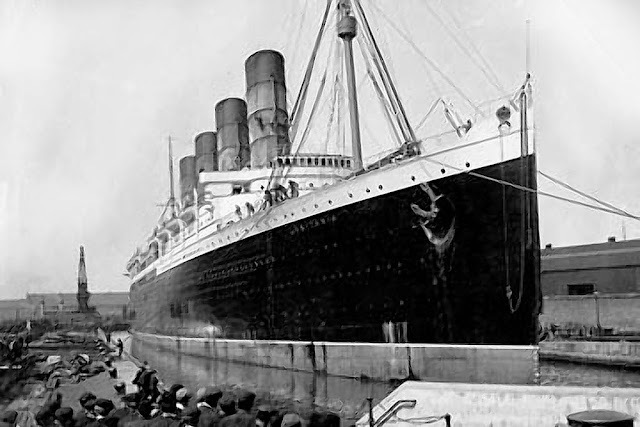 The US took 142,1543 emigrants while Canada received 109,680, a figure never exceeded by Canada until the 20th century, when 115,678 passengers travelled to Canada from Liverpool in the peak year of 1907 (218,686 went to the US). Throughout the 19th century the household name in emigrant shipping was the Allan Line, supplemented by the Cunard Line (originally foundered in Nova Scotia) with the Dominion and Beaver Lines among others, which were later taken over by Canadian Pacific. 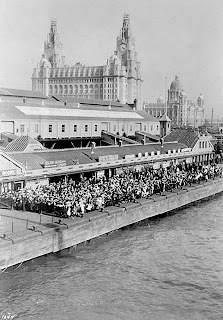 In 1906, Archie Belaney, the famous 'Grey Owl', left Liverpool for Halifax on the 'SS Canada'. He became an international figure in the study of the indigenous North American Indian. The last scheduled passenger service from Liverpool to Canada was the 'Empress of Canada', which sailed for Montreal on 7 November 1971. During the First World War, the liner RMS Lusitania was refitted at Canada Dock, including the installation of twelve 6-inch guns. The dock was connected to the national rail network by the Canada Dock Branch. The short branch line from Atlantic Junction, just west of Kirkdale railway station, into the dock was closed on 12 September 1982. The terminus was Canada Dock railway station. Although the branch line closed to passengers in 1941, it remained in use for goods. The RUS states that there should be no building on the short path of the old track in case it requires reinstating. 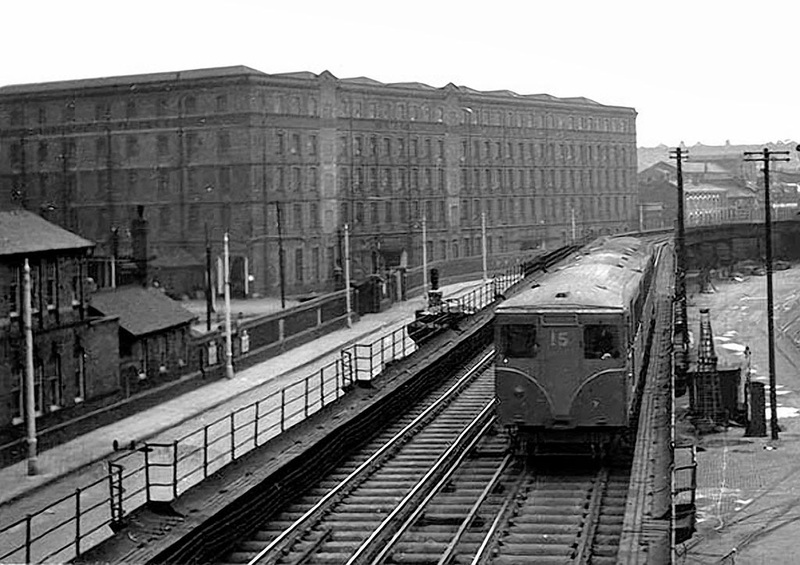 Passenger services were also provided by the Liverpool Overhead Railway via Canada Dock (LOR) station until 1956. 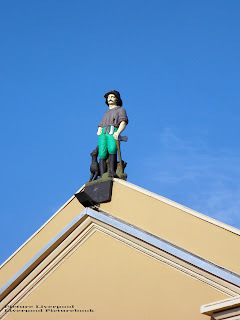 Opposite the dock is the Dominion Public House, sadly now closed, which has a statue of a settler and his dog, looking out across the mersey on the apex of the roof. Canada Dock remains in use, handling general bulk cargoes and as a site for scrap metal processing and storage.